Thank you so much for stopping by. The fact that you are here tells me that you are searching for a way to DO, BE and HAVE more in life. I am so happy for you. No matter what circumstances have brought you to this page, it is my INTENTION that what I share with you, TRANSFORM YOUR LIFE. You are a beautiful being. There is no limit to your possibility. I wish you infinite blessings. If you want to head over to the section I mention THE SCIENCE OF GETTING RICH, PLEASE CLICK THRU HERE. If you loved this, presentation please let me know! Feedback allows me to provide you with more of the content you want to see. If you would like to find more of my posts on MEDITATION, CLICK HERE. If you would like to find more of my posts on GRATITUDE, CLICK HERE. If you would like to find more of my posts on FOCUS/INTENTION, CLICK HERE. If you would like to find more of my posts on FAITH, CLICK HERE. If you would like to find more of my posts on RECEIVING, CLICK HERE. Where would you go if you could go anywhere? What would you do if you could do anything? Would you have more money? A better body? Be with your soulmate? I have been studying the Law of Attraction for years and believe that EVERYONE has the power to manifest the life of their dreams. Watch my little video. So are you ready to get started on co-creating an amazing life? COOL! WHO: Anyone who would like to make 2017 their BEST YEAR EVER! WHAT: Facebook Live Class and QnA on Manifesting an AWESOME Life. In this 30 minute workshop, you will learn my top 5 list of things I do to manifest an incredible life. Manifest an Awesome Life: Affirmations, Belief and Hustle. I have an amazing life. I am healthy, surrounded by love and able to do what I am passionate about on a daily basis. The truth is that life is not always easy. Like everyone else, I have challenges and have to face them. I’m grateful to know that I am not made of glass. I am strong and I’m smart. I’ve survived, thrived and am always moving adelante. People ask me how I can remain so positive. The answer is that I train for it. I train my mind, body, and spirit for success. There are a few tools that I have picked up along my journey to co-creating my life and affirmations are one of my favorites. Affirmations are pure statements of creation so we must be very careful with our words. Choosing to speak only those words which work towards our benefit and cultivate our highest good is a necessary tool in our ability to manifest an awesome life. Watch this quick video where I explain a bit about affirmations. For more tips on using words to manifest an awesome life, check out these posts. Learn the benefits and make a habit of implementing daily positive thoughts and words to speak your best life into existence. Remember that words must be backed by belief and followed up with action. My thoughts create my life. I understand that my thoughts control and create my experiences in life. I am free to think any thought that makes me fulfilled and happy. I am easily able to choose which thoughts I want to think. I am the master of thoughts and thus the master of my destiny. My thoughts are now flowing in a positive direction. It is natural and easy for me to think positively. I attract only positive situations because I always can see the positive. I easily follow my heart when making challenging decisions. Positive creative ideas are coming to me from everybody all day long. I always gently allow my thoughts to flow in a positive direction. Most of us have either had or heard about someone who has had a diary or journal, right? Stores are jammed with items to market to little girls. Cute, pink diaries with locks on them so they can keep their “secrets.” I’ve known girls that had several diaries as kids but got rid of them when they got more “serious” about life. What’s up with that? Did you know that journaling is one of the most widely recommended tools by therapists and counselors to supplement therapy? People who consistently journal report, better understanding of themselves, being more in touch with feelings, and being better able to deal with the past. I highly recommend journaling. Whether real life rantings, class note taking, doodling or dream recording, I have gotten great relief from keeping a journal. Much of this blog is the result of my own journaling process. I’m inspired by the tremendous feedback I get regarding the daily contributions I make. While I am a huge fan of journaling, do you know what I find even more interesting? How writing can affect the future. Statistics show people who write down their goals have over an 80% higher success rate of achieving them. Wow. This is a STUNNING statistic isn’t it? So aside from goals, how can writing help us manifest our desires? Notes to the Universe- Some people have written notes to the universe and have witnessed incredible success. I have not tried this technique but it’s something that I will experiment with this year. Morning pages- I got this technique from Julia Cameron’s book “The Artist’s Way.” I highly reccomend this book to everyone. Even those of you who are not artists. Morning Pages are three pages of longhand, stream of consciousness writing, done first thing in the morning. they are not high art. They are not even “writing.”Morning Pages provoke, clarify, comfort, cajole, prioritize and synchronize the day at hand. Here’s a video for you that get’s into my morning pages experience. 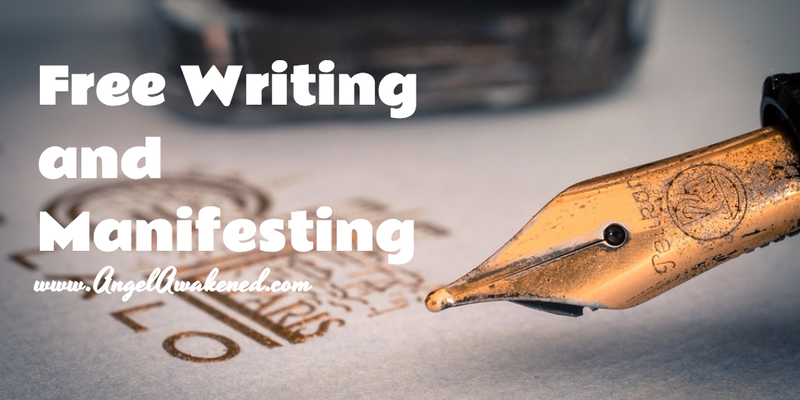 Using writing as an attraction tool can greatly speed up your ability to manifest an awesome life. So, go ahead, grab that pen and paper and get to it! Other posts I have done on writing can be found HERE.